September 26th, Sunday. 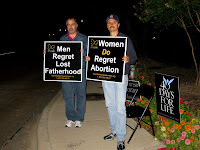 Kevin Melvin from St. Jude Church, Allen, Texas reported: "St Jude stood for Life. From midnight Saturday through midnight Sunday night, members of St. Jude stood and prayed. Some prayed for one hour, many for several hours. Whole families, with children from toddler to high school witnessed for life. By my best estimate. there were about sixty who participated. " September 28th, Tuesday. One of the planning team reported that as she was walking across the street to the vigil site to pray, a woman joined her and took her arm and said: "I have to do this. My daughter and her husband have been trying to have a baby for years. She calls me crying and says 'Mama, I want a baby so bad and they are throwing their babies away. How can they do that?' "
Rev. 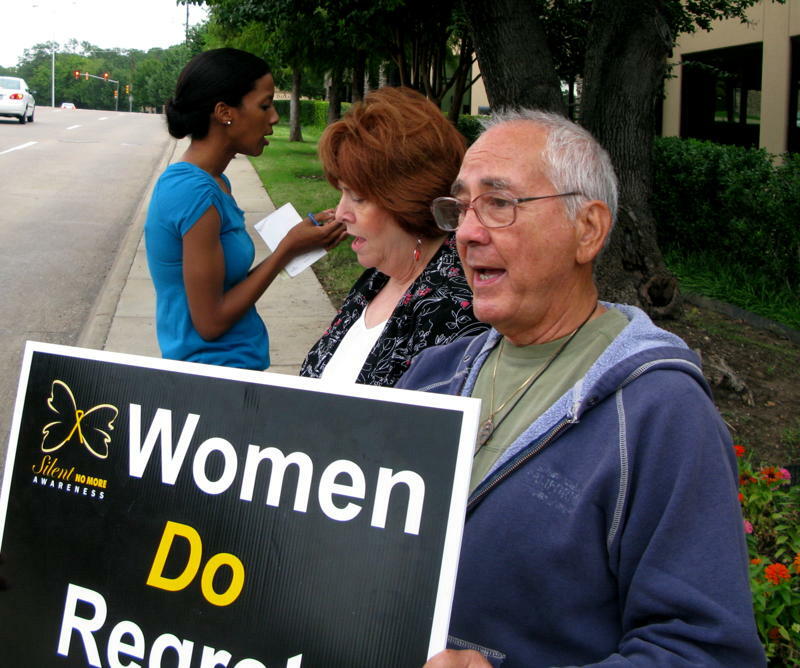 Frank Pavone, National Director of Priests for Life, shared a revealing story: "I will never forget the comment of Joy Davis, who once administered six abortion facilities," he said. "She told me that when pro-life people prayed at them, business was slow, women changed their minds and even the staff wavered ...To sum it up, she said, 'It was a bad day.' 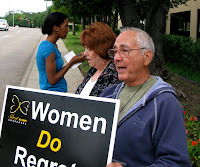 But when there was a priest or bishop present,' Joy told me, 'the abortion staff knew that 'It would be a very bad day.'" October 2nd, Saturday. Christ for the Nations came to pray. They are about missions... world missions. 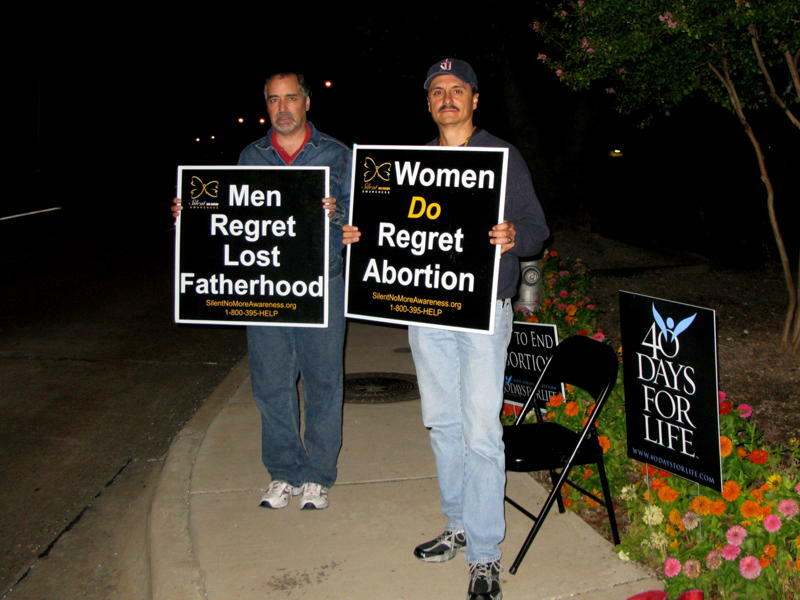 What is more needed than missionaries praying at abortion clinics like this late-term abortion facility?! They prayed & sang, lifted hands towards Heaven, and asked God to work among them in saving lives...and asked Him to bring more miracles to Dallas. Their voices of praise were so moving, that we got chills just listening to them! Praise God for their mighty witness! October 4th, Monday. Reg Platt was out praying and met a man from St. Ann's Church in Hartford, Connecticut! The gentleman was in town for business reasons, googled to find the closest 40 Days for Life vigil site and came to pray for an hour! October 6th, Wednesday. One of the sidewalk counselors, who was at the clinic (8 a.m. - 1 p.m.) reports that Fr. Lloyd Morris (retired) came and prayed all the mysteries of the Rosary. THANK YOU, Fr. Morris for your powerful prayer presence and witness. Some of the Muzyka family were also out together to pray... on their knees... facing the clinic. Then later, around noontime, about 25-30 young men & women from St. Faustina Academy (http://www.faustinaacademy.com) joined, stretched out in a long line, facing the mill and prayed the rosary...each taking turns leading the prayers. They too, fell to their knees. The sidewalk counselor said seeing all those teens on their knees... it felt like being in "a Sea of Prayers!"